This ad for Gre-Solvent appeared in The Black Cat, vol. 8, no. 7, April, 1903. Samples were to be had from The Utility Co., 230 Greenwich St., New York. This company was established in 1903 at 231-235 Greenwich St., New York City. The following appeared in American Inventor,15 August 1903, "There has been placed on the market a preparation called Gre-Solvent, that is springing into very wide use. Just what the composition of this material is is not stated, but there can be no question of its usefulness, and the claim of the manufacturer that it is absolutely harmless seems demonstrated by the experience of users who have been using it regularly for months. All the old scrubbing with Cylinder Oil, Gasoline and Sandsoap, etc., is unnecessary. Gre-Solvent is put up in a neat tin box that is handy for the 'wash-up.'" This notice is accompanied by a small ad for Gre-Solvent giving the manufacturer as The Utility Company, Barclay & Greenwich Sts. New York City. It also includes the slogan "Miles Ahead of Soap." The U. S. Patent and Trademark Office website, TESS, shows Gre-Solvent's trademark as first used in commerce 12 Feb. 1903. The registrant, in 1947, was Utility Co., Inc., 636-642 W. 44th St., New York, N.Y. This later address was home to the Utility Co. from 1908 until around 1960. This ad from 1908 gives the address as 639 W. 44th St. Utility Co. began at 235 Greenwich St. in 1903, and stayed in business in New York City until 1972. The Utility Co. also sold other "specialty" products. As described in Cycle and Automobile Trade Journal, vol. X, no. 1, 1 July 1905, "The Utility Co., of New York, makers and jobbers of a number of automobile specialties, have opened a branch store at 1781 Broadway, New York, where dealers and owners both will be catered to. Their leading specialties are Gre-Solvent, a cleansing preparation; Squail-Skin Tire Sleeves; spark plugs and raw silk machinery, gear and body wipers." Although the Gre-Solvent ad from 1903 showed a paste coming out of a tube, it seems to have been packaged mostly in cans. And it seems also to have come in a dry, powdered form. The image in the sign above shows a can inscribed Miles Ahead Of Soap / Gre-Solvent / Instantly Dissolves Grease and Grime / The Utility Co. Inc. Many cans and lids for Gre-Solvent are currently (2013) available on E-Bay and such. The Utility Co. was founded by David Goodale Holmes (1865-1944). He can be traced through no less than seven U. S. Census reports, from age 4 in 1870 to age 74 in 1940. In the 1900 census he lived at 326 Park Ave., East Orange, New Jersey, and his occupation was recorded as "Expert Machinist." Subsequently he was usually described as a manufacturer. 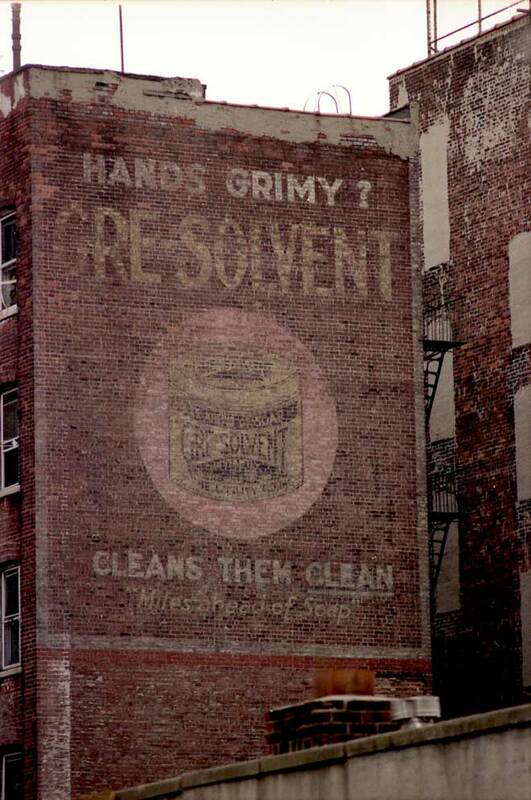 Another Gre-Solvent sign is extant in New York at 363 W. 51st St., near 9th Ave.